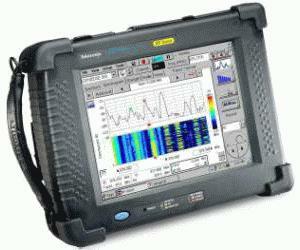 The RF Scout is a spectrum analyzer with just the right set of capabilities for interference hunting. The basic spectrum analyzer has great sensitivity, a preamp, manual and coupled controls, two traces, seven markers, channel tables, and all the other capabilities you would expect from a powerful handheld spectrum analyzer. Touch screen interface allows shallow menu systems and an intuitive user interface, so it’s easy to find all of the controls. As an example of quick instrument set-up and use, measurements markers can be placed by touching the screen above the desired signal enabling faster and easier RF problems identification, particularly intermittent problems. The signal strength screen provides an easy way to locate signals with an audible tone allowing quick direction finding while allowing your eyes to follow the aiming point of the directional antenna. Field Strength is useful when measuring human exposure to RF power or when checking power at a location. A unique variation of the field strength measurement allows measurements of the field strength of individual UMTS Node B Scrambling Codes. AM and FM demodulation capability is useful when identifying signals by their sound or station ID. The Noise Floor measurement gives users one value that reflects the overall reception conditions for a given channel. Finally, code domain and codogram measurements are provided for cdma2000, W-CDMA, and EV-DO. The RF Scout’s mapping ability enables the user to save measurements directly on the map. These measurements can be color coded. Measurements at multiple locations can easily be recalled by simply clicking on the measurement icon of the map and results can be analyzed while in the field or taken back to the office for further analysis. In addition, the RF Scout can acquire multiple signals and make different measurements on each acquisition. This feature allows multiple carriers signals to be analyzed and different measurements taken for each signal. All measurements are taken in a single pass, saving time and making the Interference hunting campaign more efficient. With less time spent driving or walking back and forth or gaining access to a building location, interference issues can be identified and resolved faster and more effectively. This rugged interference hunter has been thoroughly field tested and is ready for any thing you can throw at it. Its touch screen interface makes it versatile and intuitive while its long battery life allows you to get the job done without worrying about power outages. Indoor or out, the RF Scout is the right choice for hunting interference.